“Time - a curious thing indeed; for it seems that as the origins of this celebrated recording recede further into the past, the more it reveals of the early performing style of this ‘greatest high comedy in all opera’. 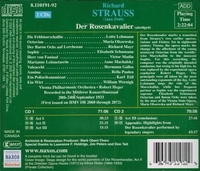 Even though the sessions took place 22 years after DER ROSENKAVALIER’s first performance, it must be remembered that three of the recording’s principals, Lehmann, Schumann and Mayr, all sang in productions within twelve weeks of the Dresden première, the two sopranos in Hamburg and the bass in Vienna. Indeed, it was in Hamburg that the intriguing single performance took place in which Lehmann sang Sophie and Schumann sang Octavian. (In those early days Sophie and, slightly later, Octavian were Lehmann’s rôles and she undertook the Marschallin for the first time only in 1924, at Covent Garden.) Olszewska’s experience of the opera was not as extensive as that of her colleagues but, by 1933, she was already greatly admired for her interpretation of Octavian. How fortunate that the greatest Marschallin of her day, perhaps the finest ever, the most enchanting Sophie, such a gallant Octavian and an unsurpassed Ochs were all able to participate in the recording. Abridged? Yes, but the principal scenes are here largely intact, so much of the atmosphere of the opera’s early productions is re-created on this historic set. DER ROSENKAVALIER was fortunate in its early recordings. Shortly after the première the three leading ladies made several discs, and over the years many fine singers set down their interpretations of choice excerpts; several are included on CD2, including Tauber (remarkably sweet-toned); Barbara Kemp (both in the studio and ‘live’ at the Theater Unter der Linden, Berlin, where she sang for twenty seasons); Delia Reinhardt (the customary Octavian at Covent Garden with Lehmann and Schumann), Conchita Supervia (the Octavian of the Rome première in 1911); and Alexander Kipnis, somewhat strait-laced, but a bass of tremendous authority, whose Ochs was later much praised at the Met. Such important fragments paved the way for this 1933 set, but it was to be another seventeen years before the first complete studio recording of DER ROSENKAVALIER would be made. Since then, many further versions of the opera have been released but none has earned the affectionate admiration accorded to this one, often referred to in short as ‘Lehmann’s ROSENKAVALIER’. That abbreviation is misleading, of course. Other performances with Lehmann survive, notably a 1939 live recording from the Met [OP2643]. The Marschallin is really not the main rôle; she does not feature at all in the second act, re-appearing only halfway through the third, and the opera’s title is not hers, but Octavian’s. Yet productions and recordings are traditionally referred to by the name of the soprano singing the Marschallin, not Octavian; perhaps this is because of the way in which audiences perceive the characters. We probably fall quite a lot in love with charming Sophie, enjoying her mettlesome ways and crystalline high notes. Maybe we envy Octavian, pretty successful in his adolescent conquests and the fortunate hero who wins his delightful heroine; but the Marschallin? Do we not empathize with Marie Thérèse? We vicariously share the last close moments with her lover, we too need sometimes to stop the clocks and we feel the depth of her wistfully confided ‘Ja ja’ to Faninal. Oh yes, DER ROSENKAVALIER is surely the Marschallin’s opera. In his Centenary Biography of Lotte Lehmann (Julia MacRae Books, 1988), Alan Jefferson corrects the long-held belief that the Marschallin’s final two words had to be sung on this recording by Elisabeth Schumann because Lehmann had already left the studio, thinking her work for the day was finished. In fact, Jefferson shows that the relevant’ take’ was the first made in the morning, so Schumann’s assistance was needed because Lehmann had not yet arrived…Time – is such a curious thing. Lotte Lehmann, a glorious lyric soprano with rare dramatic insight, was born in Perleberg, North Germany in 1888. From 1909 she sang in Hamburg, soon progressing to Vienna where her repertory, reflected by the range of her many recordings, included rôles by Mozart, Puccini, Massenet, Tchaikovsky and especially Wagner and Richard Strauss. Lehmann first sang in South America in 1922, at Covent Garden in 1924, and, in 1930, in the United States, where she later made her home. Lehmann developed a brilliant career as a Lieder recitalist and in retirement taught and supervised master-classes. She died in California in 1976. The contralto Maria Olszewska was born in Donauwörth, in Bavaria, in 1892. After studying in Munich she sang in Leipzig, Hamburg, Munich, Vienna and Buenos Aires. Following her Covent Garden début in 1924 she sang there regularly for eight years, her gloriously rich, dark voice and dramatic temperament particularly suiting rôles such as Erda, Fricka, Brangäne, Azucena and Octavian. Olszewska’s American career began in Chicago in 1928 and she first sang at the Met in 1933, remaining there for three seasons. After the war, Olszewska became Professor at the Vienna Conservatory and she died in Klagenfurt, Southern Austria, in 1969. Elisabeth Schumann, born in Merseburg near Halle, made her début in Hamburg in 1909. She joined the Vienna Staatsoper in 1919 having already sung at the Met in New York in 1914. Her first rôle there, as at Covent Garden in 1924, was Sophie. Her bright, light voice also suited Mozart rôles such as Zerlina and Susanna and Adele in DIE FLEDERMAUS, and she made a speciality of Schubert Lieder, many of which she recorded. Schumann left Austria in 1938, moving to the United States, where she taught singing at the Curtis Institute and died in New York in 1952. After originally studying medicine, Richard Mayr made his singing début at Bayreuth as Hagen in 1902. He joined the Vienna Opera, where he excelled in comedy, notably Leporello, Figaro and Ochs, but was equally successful in Wagnerian bass-baritone parts. Mayr sang in the première of Strauss’ DIE FRAU OHNE SCHATTEN in 1919, regularly participated in the Salzburg Festival and first appeared at Covent Garden (as Ochs) in 1924. In 1927 he sang the first of his four Met seasons, in which he took principally Wagnerian rôles. Mayr was born near Salzburg in 1877 and died in Vienna in 1935.